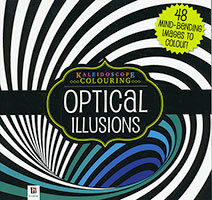 Kaleidoscope Magical Metallic Marker Kit, , 9781488937194 at Carnival Book Shop Carnival Book Shop Kids Choice Childrens Bookstore, Best Books at discounted prices delivered direct to you. Carnival Book Shop Kids Choice here and save! 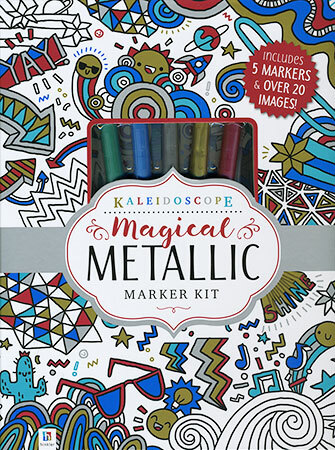 Kaleidoscope Colouring: Magical Metallic Marker Kit allows you to express your creative side and bring some shine to your world! 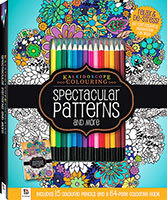 Use the 5 metallic markers to add shimmer and shine to these delightful colouring designs! The book contains over 20 exquisite images that feature magical patterns. Gorgeous flowers and so much more that are just waiting for you to add some shine!